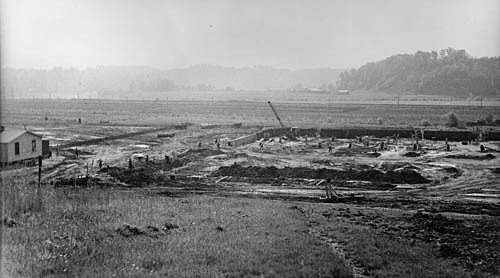 Excavation at the U.S. Rubber Plant began in 1944 at a site just west of Scottsville. James River in the background. This photo shows the plant building nearing completion in 1944. 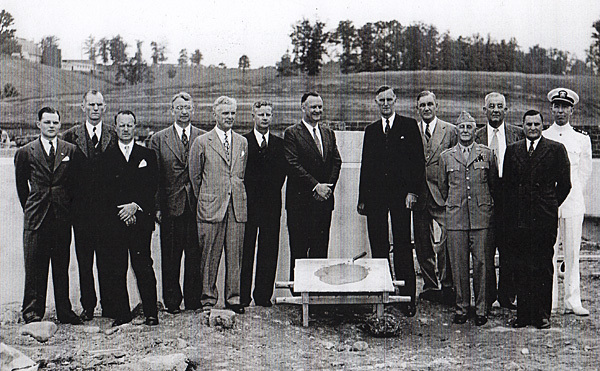 At the end of WWII in 1945, Uniroyal purchased the plant from the U.S. Government, and the Scottsville Plant officially joined Uniroyal. Uniroyal operated the plant as a manufacturing and supply unit to the tire industry, one of the largest industries in the world. The plant, in its history, has produced Rayon (a cellulose by-product) for tires and, with the advent of synthetics, has produced Nylon and Polyester tire cord fabric and Fiberglas fabric. Over the years little change could be detected in the outside appearance of the plant, although machinery and equipment were constantly being changed and modernized. However in 1958, the skyline began to change as the new building for treating tire fabric was under construction. By the end of 1959, operations were underway in Scottsville's new Hot Stretch Treating unit. Since the 1959 addition of the Treating unit, the plant has benefitted from periodic expansion and modernization programs. 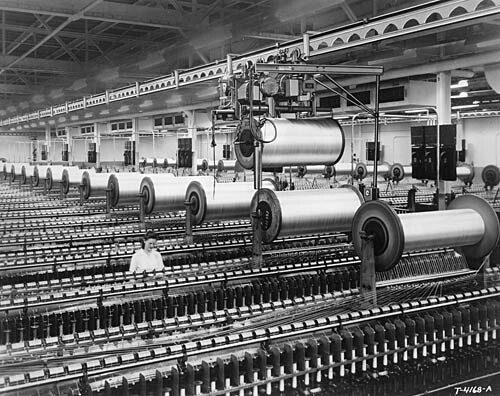 In 1968, the Weaving Department was enlarged and the entire plant was air-conditioned. 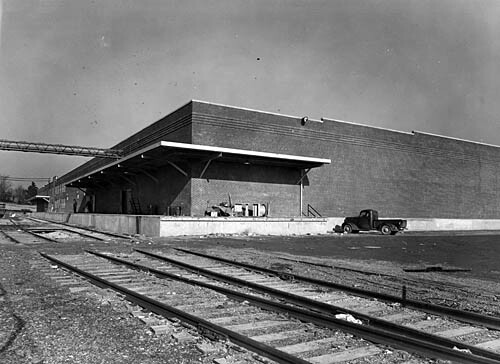 In 1973, a warehouse expansion doubled Scottsville's capacity to store finished goods. The Hot Stretch machine was modified in 1983 to run double dip polyester fabrics. In 1984, the Treating unit was further modernized by modifying the ovens and tension controls to meet the more critical uniformity demands of monoply fabrics. The respooler operation was phased out over three years beginning in 1987. Ply Twisters were modified to run larger packages, which eliminated the need to respool ply bobbins, resulting in quality and cost improvements. The peak employment period for Uniroyal's Scottsville Plant was in the late 1960's and early 1970's. At that time, the plant employed 340 people and operated four shifts, five days a week. In the 1980's, the plant operated on a steady five-day per week basis. By the late 1950's, the Scottsville Plant was well established with several smaller independent tire makers, as well as continuing to supply Uniroyal Tire plants. In 1972, the plant began production for The People's Republic of China, beginning a relationship that continued through the years. The customer list constantly expanded to include clients on five continents. In August of 1986, the Scottsville Plant became part of the joint venture between Uniroyal, Inc., and the B.F. Goodrich Company, which operated as the Uniroyal Goodrich Tire Company (UGTC). In May of 1990, UGTC was purchased by The Michelin Groupe, and with this purchase the Scottsville Plant's mission changed. The plant was then dedicated to supplying the needs of Uniroyal Goodrich and Michelin tire plants. In 2002, Michelin's textile plant in Scottsville was sold for $7-million to Hyosung America, Inc., an affiliate of Hyosung Corporation of Korea. Under the terms of the agreement, Hyosung offered employment to all 240 Scottsville employees and also planned to update the plant. In November 2009, the Hyosung plant manager, Roger Hutchins, advised the 106 remaining plant employees that the Scottsville plant would shut down by the end of January 2010. Mr. Hutchins said that the slumping economy and pressure from global manufacturers cut into their ability to make a profit building tire cords. The top photo is part of the Raymon Thacker Collection at Scottsville Museum. The remaining four photos are part of the Hyosung America, Inc.,Collection at the Museum.